In a post from a little over a year ago I wrote about Shinto, the “way of the kami” or nature spirits in Japan. One of the most important national Shinto events takes place throughout 2013 and especially this fall*, the Shikinen Sengu, which is the ritual rebuilding and re-dedication of parts of Ise Jingu, the most significant Shinto shrine in Japan. 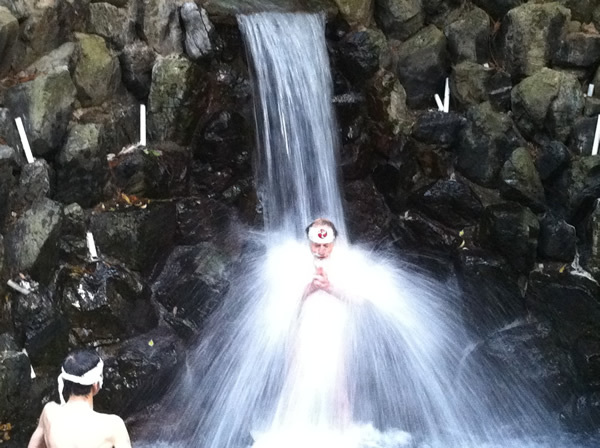 Shikinen Sengu takes place every twenty years, with 2013 marking the 62nd time the year-long ritual event has occurred. The ritual cycle originated in approximately 690 CE, more than 1300 years ago. “And all this matters why?” you might ask. Perhaps the most visible reason is the sheer beauty of Shinto. If as a Westerner you want to encounter a foreign culture on its own terms, one of the vivid and memorable ways is through its physical manifestations in objects, tastes, sounds and smells. The atmosphere of Shinto is something anyone can begin to appreciate immediately, because Shinto shrines and ceremonies are so public. And in Shinto we can encounter a distinctive Japanese expression of what I have experienced as the spirit of Druidry, a love and reverence for the natural world, seen through the unique perspectives of an entire culture and nation. 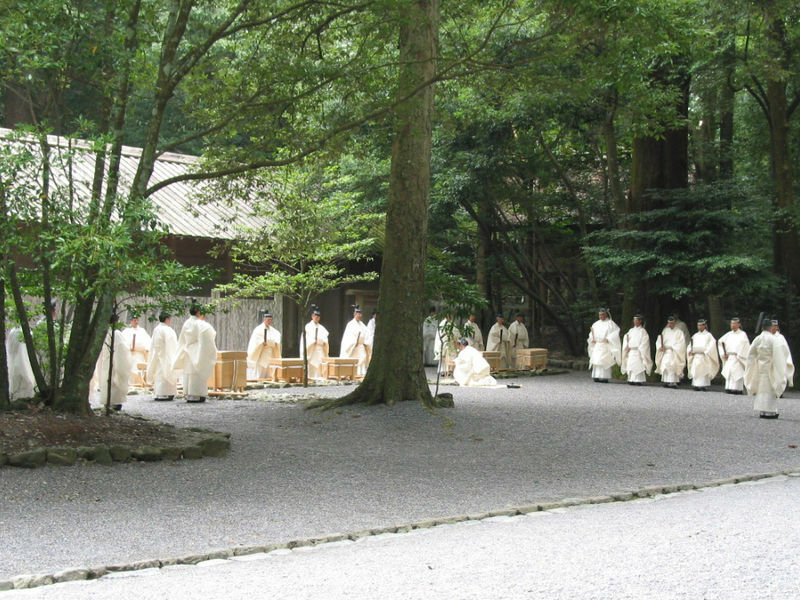 Shinto provides one model for doing earth-based religion on a large scale. And I hope you’ll see why I think it’s really cool. 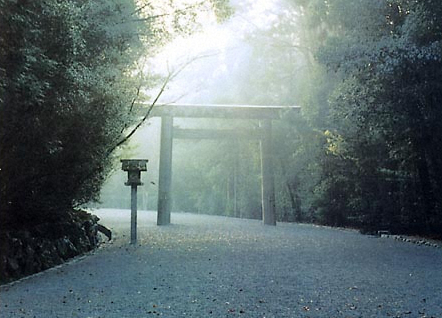 Ise Jingu (ee-seh jeen-goo), the shrine at Ise in Mie Prefecture on the main island of Japan, covers more than 20 square miles of mostly forested land. You pass through the torii gate (above image), sign of a Shinto shrine, to enter. 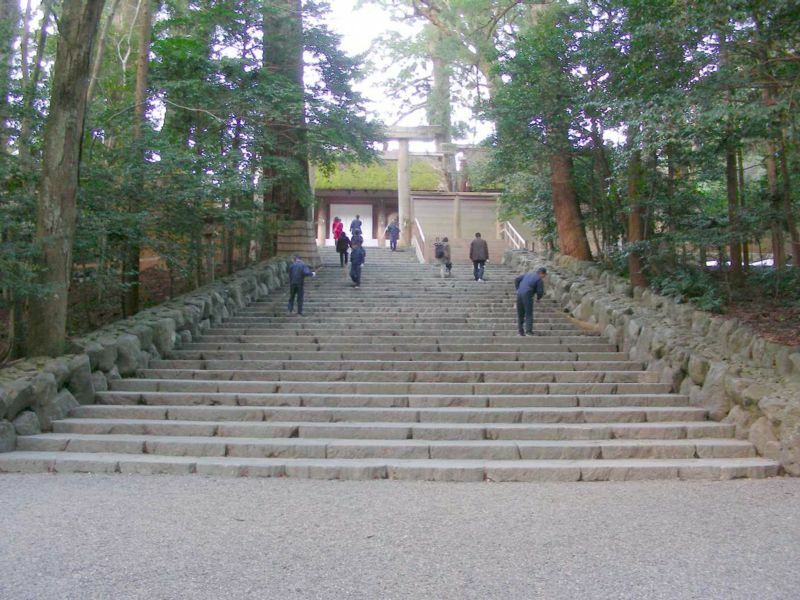 Shinto expresses a sense of the “permanent renewal of nature,” as a Mie tourist guide describes it, and Shikinen Sengu, literally the “Ceremonial Year Shrine Relocation,” renews the shrine quite literally, by rebuilding significant portions on an adjacent location. Imagine reconstructing your own house every twenty years, on the same lot, planning in advance and spending a year to do the job, with song and ceremony and all your family members visiting at some point during the year, with picnics and celebration and parties and priests to bless the proceedings, and you begin to get an idea on a very small scale of what’s involved. Shinto is more practice than belief: what you do matters more than how you understand and talk about it, though of course that’s important too. Shinto focuses on harmony between people and the natural world. Get out of whack, and Shinto shows you things to do to resolve imbalances and restore the original state. Often it’s a case of not taking ourselves so bloody seriously. If you can’t recall when the last time was that the universe bowed to you, maybe that’s because you can’t remember the last time you bowed to the universe. And the latter is generally better for you than the former. Even if taking a cold outdoor shower under a stream doesn’t appeal to you, for instance, you still get how it might restore a healthier sense of proportion. The practice of misogi or purification gets real, especially when you do it in winter, as practitioners do in Japan and in the U.S., like Rev. Koichi Barrish who is priest at the Tsubaki Shrine in Washington State. Note that I’m not rushing to be first in line for this particular practice. I’ll be talking more about these things, and why I’m writing about them, in Part 2. *My principal sources for the information in this post, beyond my experience of living in Japan for two years in the early ’90s, are this detailed PDF document about Shikinen Sengu, published by JNTO, the Japan National Tourist Organization, and the website for the Tsubaki Shrine in Granite Falls, Washington. Excellent picture of misogi. I’ve read about it, but never seen a picture. Thanks for sharing!